No matter the quality of your air system, eventually impurities will collect and be carried throughout your home or office. Since most of these contaminants are microscopic, disposable filters cannot be counted on to remove them. Even with attempts to thoroughly clean a room with powerful disinfectants and air sprays, the effort is quickly defeated as the recirculating air system will bring a new batch of contaminants into the air and onto your home’s furnishings. There are many benefits to having your home air ducts cleaned, including improving air quality, removing unpleasant odors, and safeguarding against illness. Recent experimental studies have uncovered another enemy to your health – the infamous dust mite. This microscopic organism clings to dust particles, secreting a protein that is highly irritating to human skin and the lining of the lungs. The mite hides out in the duct work, in home furnishings, and is carried throughout your home or office by the central air system. Start enjoying a fresher, healthier environment in your Scottsdale area home or office and have your ductwork cleaned and sanitized today. Cook Bros. Cleaning & Restoration provides home and office air duct cleaning services in Phoenix AZ, Scottsdale, Glendale, Peoria, and the surrounding areas. 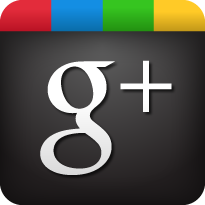 See what we can do for your office or home air quality today by calling (602) 246-7999. 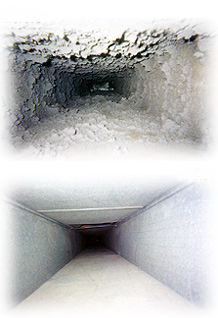 We clean all air ducts using Cook Bros powerful duct cleaning equipment and one of our two cleaning systems. The first is our truck mounted duct cleaning system, great for your average jobs. Then we have our contained air duct cleaning system. This system is great for people with sensitivity to odors, or if fire or water damage occurs in your home and has contaminated your ventilation. Learn more about our contained duct cleaning system. To contain your duct work we plug each opening after removing and cleaning the register. Then we use one of our powerful Turbojet dust collectors that range from 2000 CFM for residential air duct cleaning all the way up to 3500 CFM for commercial duct cleaning. These dust collectors have 3 separate filters with one HEPA filter that filters 99.97% of all dust and contaminants that are removed during the cleaning process. We use a variety of tools depending on the type of duct work and situation such as high pressure air tools, high powered brushes (a must for underground air returns! ), and source removal methods with HEPA backpack vacuums. Apply deodorizer, sanitizer or anti-allergen products depending on your home’s specific needs. Do you suffer from allergies? Our air duct sealant can lock down airborne allergens that could be coming from your ventilation. If fire or smoke has previously contaminated your air ducts then we can help by cleaning and applying our smoke deodorizer. 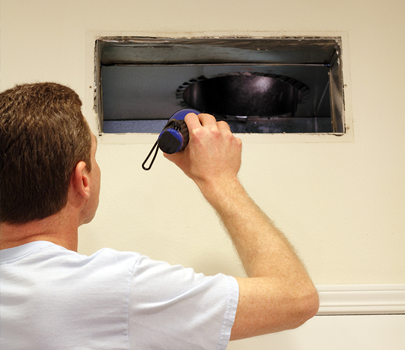 We also assist in removing animals that may be trapped in your home’s air ventilation system. We also specialize in tobacco smoke odor removal in air ducts. If your moving in or out of a home and need our tobacco smoke removal services, call us today at (602) 246-7999. Additional vents only $10 ea. Underground returns, air handler units & treatments add’l. Hi Jorel- Just wanted to add my two cents' in, you guys were great. Gerald was especially wonderful, coming in so very late and being so pleasant about it. If you should ever want a reference from us, just let us know!